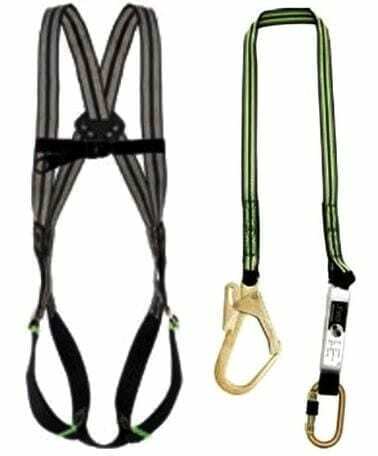 Pick up the single point standard harness kit from Rope Services Direct if you need a safe, secure restraint system for working at height that is made from high quality materials and offers adjustability to fit every body type. With this kit you get a single point harness, a shock-absorbing lanyard with webbing protection and a carry bag as part of an impressively affordable bundle. The harness has adjustable thigh straps, a comfortable sit strap, a D-ring on the rear to keep the user safe and prevent falls from high structures. The lanyard measures 1.8 metres in length and has webbing to cut the force of the fall and make sure that injuries are not caused. It also has a hard-wearing, easy to use scaffold hook at one end, while the other is equipped with a karabiner to clip onto the harness. The bag brings the whole thing together, providing a place to keep tools while the kit is in use, or store the harness and lanyard in between deployments. Check out the 2 point scaffold kit or the 3 point restraint kit if this single point version does not meet your needs. We also have a great range of individual lanyards and fall arresters available. Need Help with Choosing Safety Equipment? Single Point Standard Harness Kit Overall rating: 5 out of 5 based on 6 reviews.